You gotta watch In My Life! Thanks to a film like this, I believe in the talent of Filipinos again! Veteran actress Vilma Santos definitely drew in a lot of moviegoers, but her son Luis Manzano, and the impeccable John Lloyd Cruz, were equally commendable for their great acting mettle. While the two actors were playing the role of gay lovers, there was nary a hint of awkward, exaggerated or forced acting on their parts. Love love love John Lloyd Cruz as always. He has proven once again that he can really act given any role. He is indeed one of the best we've got in this generation. As for Luis Manzano, this may be his first major drama role but I gotta give it to him. He did his part excellently. Vilma Santos is seamless as always. It's been years since she last did a movie. Seeing her on the big screen again is refreshing. She didn't look like she aged one bit, but her many years of experience in front of the camera is very evident. She scored another perfect ten here in In My Life. I'm sure many in the audience only wanted to see that much publicized lip-locking between the two gentlemen. This early I can tell you that it is overrated. This is because as you sit inside the theater to immerse yourself in the story, you will find soon enough that that scene is really just a strand of hair that hardly matters when you are left admiring the masterpiece that director Olivia Lamasan put together. Story-wise, In My Life is kept very simple and straightforward. It had the usual mix of drama interspersed with comedy. We, Filipinos, love to poke fun at those who could not speak straight English or find it hard to converse in English in a foreign land. The movie leaned on this to give viewers a good laugh. 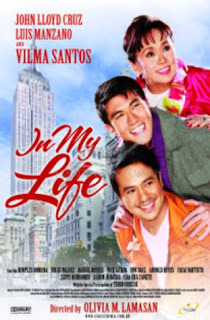 Vilma Santos provided comic relief as she struggled with her words to get by in New York. She also epitomizes those Filipinos who were brought to America out of unforeseen circumstances. One day you are content in your comfort zone here in the Philippines, and then the next minute you are thrown in unfamiliar grounds and forced to survive in the land of milk and honey. There were no scenes or dialogues that stayed with me as I left the theater, yet In My Life is worth watching. Its story is close to our hearts because I'm sure many of us have friends or relatives working in America. In My Life is more than about homosexuals. It more importantly mirrored the struggles of Filipino families and their quest for greener pastures outside of the country. Wow thanks for this great review! I don't normally watch Tagalog films unless I read good reviews about them, and your review got me wanting to watch this movie. :) I think John Lloyd is the best in this generation, too! He acts so naturally. I loved him in One More Chance and A Very Special Love. Heehee.